Grand front Osaka, Abeno Harukas and etc, it seems large scale retail stores are increasing all around Kansai area. Recently in Kobe, Kobe harbor land had renewal as “umie”. It hasn’t been taken up by the media that much since the building was already exist. 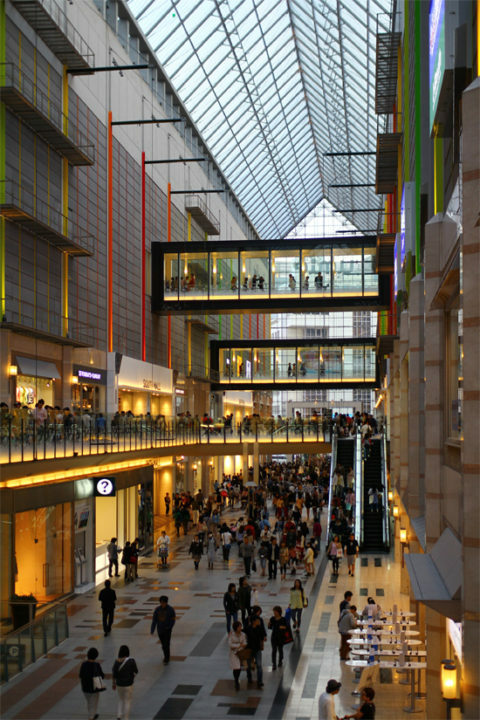 On the both sides of the atrium, there are fast fashion stores like GU, GAP,H&M and ZARA, large stores like book store and BABIESRUS and cinema complex. Personally, we prefer to go shopping to the small street level shops than to go large scale retail stores, but it looks nice crowd of people passing by lively. There was an exhibition of Shogi by professional Shogi player on this atrium yesterday. In contrast to this “umie”, there is a district called Sakae-machi dori, bit away from umie to the mountain side, where small unique shops stand side by side. When you travel and visited some countries, the memories might be consisted by such small shops not by those large one isn’t it? IT is not favorable that these small shops disappears because of the large scale retailer, but as long as there is a demands of people, we wish they exist together and create delightful town.